One of the mantras of joining the online global community is that what you post on the internet stays there forever and forever. We all have heard this so it always amazes me when I see some of the thing that people post in various types of online communal discussions. We always make sure to let our kids know not to post pictures or comments that they wouldn’t want college admissions folks to see. Not everyone follows that advice themselves. There are lots of places to post your thoughts and ideas online, for this article I’m focusing on the behaviors I see in Blog comment threads and Group discussions on forums such as LinkedIn or Focus. 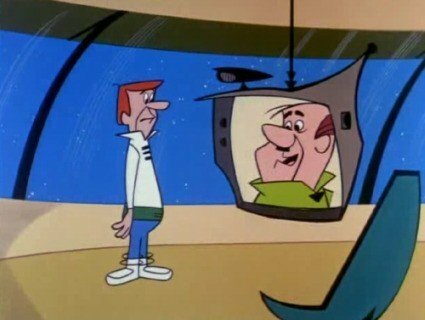 The first time I saw a video phone call was the 1964 World’s Fair in Flushing, NY. It’s come a long way since then. Real-time video calling is completely unremarkable today. It’s just the norm. For some reason, though, we naturally tend to think of these interactions as telephone calls and not as face-to-face meetings. If you think about it, it doesn’t get much more F2F than staring at a screen with the other party’s face all up in your face. I’ve noticed that sometimes we (this includes me) do things that we oddly would not do in person, but we are very comfortable doing them on a Skype or other video call. So here are a few things to avoid. If you haven’t used Survey Monkey, you should check it out. I’ve used it a few times and it works really well. You can customize the format, questions and how you want to receive your feedback. They’ve now created a Survey Monkey/Facebook app so you can embed a custom survey directly on your Facebook Page. I haven’t tried it yet but this link has the instructions on how to add the app and set up a survey. This app only works on Facebook Pages – not on personal profiles. If anyone has tried it, or is going to try it, let me know how it works. I plan to check it out myself but not until next week. I’m thinking of doing a survey about surveys. According to a study performed by CNBC, the number EMEA business leaders relying on Twitter as a vital tool in their business and marketing efforts, has grown significantly. Looking at the number of users among European executives who use Social Media as a tool, Facebook continues to lead the pack. Twitter comes in well below when based on the number of accounts. 77% of execs have Facebook accounts while only 38% have Twitter accounts. The point to note however, is that the Facebook number has declined in the last 12 months from 81% to 77%, while Twitter use continues to grow. Their 38% was up from 31% a year ago. The CNBC article, posted on 9/13/11 also takes a look at some other interesting trends in business use of technology. Definitely worth a read. Level 2 Twitter tips are for those who’ve mastered the basics of Tweeting and are now ready to move on to the real value of the platform. At first glance, it might seem a little redundant to have the ability to create lists and saved # searches with the same topic. Depending on what you’re trying to accomplish with Twitter, using both can be invaluable. Keep in mind that lists and searches have two very different functions. List: This groups all tweets by users that you manually add to the list. The posts that you see on the list will include all topics that the selected users tweet about. There will be no tweets from any users who you have not added to that list. Saved Hashtag Search: This groups all tweets from users throughout the Twitterverse that have posted an update with the hashtag you have designated in the search. Here’s an example of why I use both. I signed up for Scribd maybe 3 years ago. I used it for a few different things – that all could be done elsewhere and better. Perhaps I’m late to the game with this epiphany but I am so excited that I found something useful that can provide value to me and to my online community. The challenge, to me, is always that the printed version looks a lot like a screen shot. Not exactly, because it does strip out the sidebars and the blog header and just gives you the article but… once printed, the only way the document relates back to you, is through a footer which has the long url linking to the post. Sooooo… By taking the post after it’s written, cutting/pasting the text into MS Word, then saving it as a PDF you can upload it into a Scribd account. If you create (the first time) a Word Template, all of your docs will have the same look and feel. That all takes about 5 minutes adding on to your blog post time. Then add a link to the bottom of each post which connects to the url for the PDF in Scribd. I’ve only just started to do this but click on the link below to see how it works. Conventional wisdom tells us that most businesses have created accounts on “the sites”. I’m not going to list all of the social media platforms here – that’s another topic for another day. There’s been much hype over the last few years about successes that have come from posting updates and all the sundry add-ons. This encourages people to believe that engaging in social media will help grow their business. Social Media lovers who use both Twitter and Foursquare really need to look at the impact of cross-pollination between the two. You may be hurting your online image if you’re not doing it right. There are basically two kinds of Foursquare users – casual and passionate. If you are a passionate user, you most likely have your FS posts automatically posting to your Twitter and/or Facebook profiles. You need to think it through to make sure you’re accomplishing what you intend. If you are involved in Social Media to be a part of the global online community you have to consider it what you are doing is furthering that goal or hurting it. How many times have you seen that slogan on a take-out pizza box? Does it somehow validate your decision to choose that particular restaurant? If you see it on a pizza box at someone else’s home does it somehow persuade you to switch your own pizza preference? How about the plethora of auto insurance companies that each claim they will save you hundreds of dollars if you switch from your current carrier, or the bank claiming they have the best loan rate? I was having coffee the other day with my friends, Heather Flournoy and Chris Roberts. To be more accurate I was actually drinking bottled water which, although she is far too nice to say anything, I suspect was noticed by Heather. Heather is the founder and driving force behind KATONAH GREEN, a very well-known sustainable living community organization and blog. Anyway – I digress. Somewhere in the conversation we got to talking about how some mature businesses have, in the last year or so, tiptoed into the Social Media waters.